Energizing Face Balm 50 ml / 1.7 fl. oz. is an energy lotion for devitalized skin. and reduce signs of fatigue. Shaving is a daily assault on male skin: It destroys the hydro lipidic film; a natural protection of the skin whilst causing further damage through small cuts and abrasions. Skin is, therefore, sensitized, dehydrated, uncomfortable and irritated. A recent study shows that 83% of men associate skin irritation problems with shaving. 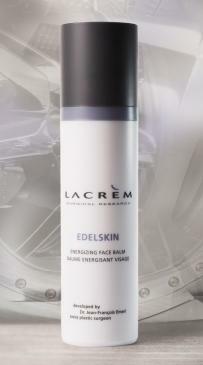 In response, the researchers at LACRÈM have perfected the first after-shave skin care system with a double action: soothing and energizing. - Flex-zone complex: The synergetic action of polymers with purified vegetal extracts (ginger, white wormwood, and cinnamon) soothe the area after shaving and regulate the production of sebum. - Aloe Vera: containing more than 200 bioactive components, aloe Vera gel is renowned for its calming and revitalizing properties. - Hibiscus: Thanks to its toning properties, signs of fatigue are erased, wrinkles are smoothed and the skin is awakened. Immediately after shaving, apply in gentle circular movement starting from the bottom and then to the top of the cheek in order to stimulate blood circulation. Avoid the eye area.